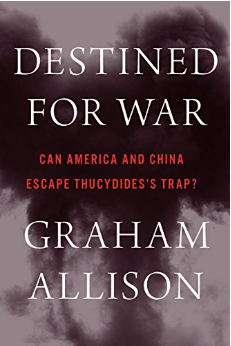 Graham Allison, the current Director of Harvard’s Belfer Center for Science and International Affairs, is a professor at Harvard’s John F. Kennedy School of Government. Prior to this, Allison worked at the Pentagon as an advisor, was a special advisor to Secretary of Defense Caspar Weinberger under President Reagan, and was the Assistant Secretary of Defense for Policy and Plans under President Clinton. On account of his service, Allison was awarded the Defense Medal for Distinguished Public Service by President Clinton. China and the United States are headed toward a war neither wants. The reason is Thucydides’s Trap, a deadly pattern of structural stress that results when a rising power challenges a ruling one. This phenomenon is as old as history itself. About the Peloponnesian War that devastated ancient Greece, the historian Thucydides explained: “It was the rise of Athens and the fear that this instilled in Sparta that made war inevitable.” Over the past 500 years, these conditions have occurred 16 times. War broke out in 12 of them. Today, as an unstoppable China approaches an immovable America and both Xi Jinping and Donald Trump promise to make their countries “great again,” the 17th case looks grim. Unless China is willing to scale back its ambitions or Washington can accept becoming number two in the Pacific, a trade conflict, cyberattack, or accident at sea could soon escalate into all-out war.